This week Holy Redeemer welcomed our newest member, a sturdy metal shipping container that will house our emergency supplies. We are holding a contest between now and May 29th to name the container. Mrs. Lukosh will buy the winner a LifeStraw personal water filter. Enter your container name idea in the comments below! (Scroll down to “Leave a Reply”). Generate ideas with your friends and family. Once we have generated a lot of ideas, we’ll vote on the best ones! To be considered, we need to have your name suggestion, as well as your name and connection to Holy Redeemer (school family or parishioner). This week our new container came. 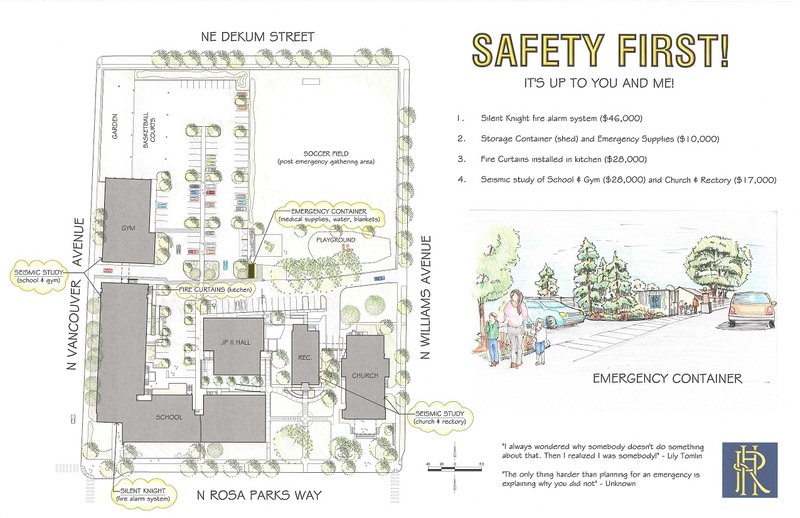 The Earthquake Committee has been dreaming of a secure, sturdy way to store supplies since day one – in January 2018. Thanks to the hard work of our auction committee and all the supporters who raised a paddle at the auction, Mr. Baggenstos was able to have a gorgeous container delivered this week. This afternoon members of the Earthquake Committee explored our new digs during our regular biweekly meeting. Don’t park here! The doors swing out.